This lightweight walker has an aluminum frame and is height adjustable from 31.5" to 38.2". The two-button design allows each side to fold in independently making it manageable for seniors and other users such as those recovering from injury or surgery. A push-down braking system and ruber feet on the back legs make this a stable and safe walker for seniors and others who need its support for independence. 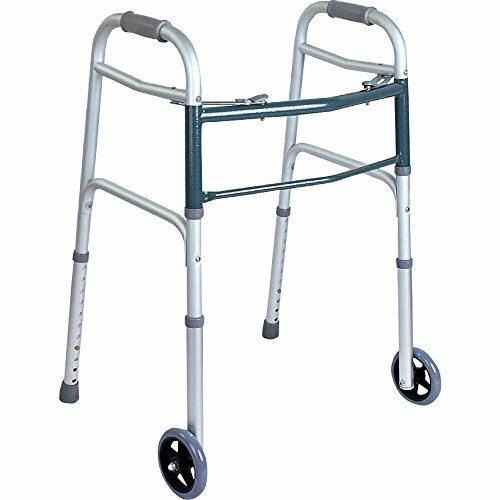 This walker has a lightweight aluminum frame that adjusts between 31.5" and 38.2" to meet the needs of seniors, or anyone who has suffered an injury or is recovering after surgery. The BodyMed walker has a two-button design so that each side folds in independently. This mobility aid has rubber feet on the back legs, and a push down braking system making it a safe walker for the elderly and others who need support. BodyMed walkers can support up to 300 pounds. If you have any questions about this product by BodyMed, contact us by completing and submitting the form below. If you are looking for a specif part number, please include it with your message.